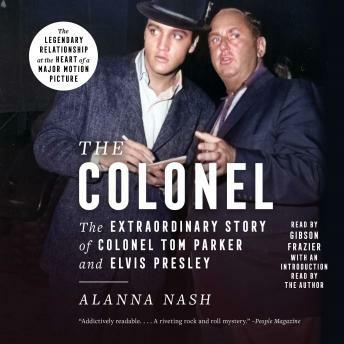 In The Colonel, Alanna Nash, the author of Golden Girl: The Story of Jessica Savitch, explores in-depth the amazing story of Colonel Tom Parker, the man behind the legend and the myth of Elvis Presley. The result is a book that reads like the most riveting of real-life detective stories—one that will completely change your view of Presley's life, success, and death. While scores of books have been written about Elvis Presley, this is the first meticulously researched biography of Tom Parker written by someone who knew him personally. And for anyone truly interested in the performer many consider the greatest and most influential of the twentieth century, it is impossible to understand how Elvis came to be such a phenomenon without examining the life and mind of Parker, the man who virtually controlled Elvis's every move. Alanna Nash has been covering the story of Elvis Presley and Colonel Tom Parker since the day of Presley's funeral in Memphis, Tennessee. She was the first journalist allowed to view Presley's body, a compelling and surprising sight. But the profile of Parker attending the funeral in a Hawaiian shirt and a baseball cap was even stranger, and led her to investigate the man behind the myth. It has been known for twenty years that Thomas Andrew Parker was, in fact, born in Holland as Andreas Cornelis van Kuijk. But Nash has dug much deeper and, in a masterpiece of reporting, unearthed never-before-seen documents, including Parker's army records and psychiatric evaluations, and the original police report of an unsolved murder case in Holland that lies at the heart of the Parker mystery. In the process of weighing the evidence, she answers the biggest riddle in the history of the music industry, as it becomes clear that every move Parker made in the handling of Elvis Presley—from why he never allowed Elvis to perform in Europe, to why he didn't halt Elvis's drug use, to why he put him in so many mediocre movies, and even the Colonel's direction of Presley's army career—was designed to protect Parker's own secrets. Filled with startling new material, her book challenges even the most familiar precepts of the Presley saga—everything we presumed about Parker's handling of the world's most famous entertainer must now be reevaluated in the light of information Nash reveals about Parker, who cared little for Presley beyond what the singer could do to bolster the Colonel's precarious position as an illegal alien. Elvis Presley, as one of Parker's unwitting victims, paid a major price for the Colonel's past and his overwhelming need to be more important than his client. As a result, Presley was never allowed to reach his potential and died in drug-induced frustration over his stunted and mismanaged career. In this astonishing, impeccably written, and vastly entertaining book, Nash proves that the only figure in American popular culture as fascinating as Elvis Presley is Colonel Tom Parker, the man who shaped Elvis, who in turn helped shape us.